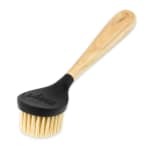 "these are much better than the earlier ones that I purchased years ago that loosened up after a while and the metal housing around the nylon bris..."
"This brush is great for scrubbing pots & pans"
"This brush will collect food particles in the bristles, which is fine. However to remove the particles I lightly tapped the handle on the edge of..."
"these are much better than the earlier ones that I purchased years ago that loosened up after a while and the metal housing around the nylon bristles had to always be pushed back in tightly"
"This brush will collect food particles in the bristles, which is fine. However to remove the particles I lightly tapped the handle on the edge of my sink, knocking the food out of the bristles. This worked well until the handle broke at its weakest point...right where it connects to the brush. An alternate way to clean the brush would be to comb it with the proper tool. This would be a PITA. This brush is poorly designed and is too delicate."